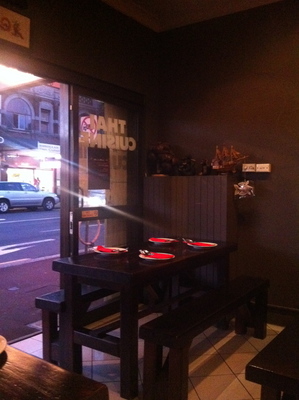 Blue Wok Thai, along popular Crown Street, has been re-named from The Blue Wok for all the right reasons. Co-Owner, Nat Shinsiripakorn has traded in his engineering career to work with food, and having tried a number of their dishes, the Sydney culinary scene has every reason to celebrate. Clearly, food is his passion, and Nat is also someone who experiments with recipes away from his work as co-owner and chef at Blue Wok Thai. It all comes together, especially with his inventive main dishes on the monthly specials menu. Exciting times all round. The ambience is welcoming, and a feeling of serenity and calm beckons upon you with an authentic welcome. Come to this restaurant at around 7:30pm on a Tuesday night, and the vibe is electric, and nearly every wooden table is taken. When you come here, you will begin to appreciate why. Dinner is available from 5pm, and there is a special lunch menu available from 11am to 4pm, Monday to Saturday. Quality attention to detail gives you every reason to smile. Although Blue Wok Thai is a small restaurant with the option to takeaway, you can easily feel like you're eating in one largesse food sanctuary. At dinner, quality candles set the scene on every table, and tasteful cutlery is used. A jug of water is granted to your table with speed and finesse, without the need to ask for some. Chopsticks are also available upon request. Blue Wok Thai is also a cash only establishment, with credit card facilities on the way. 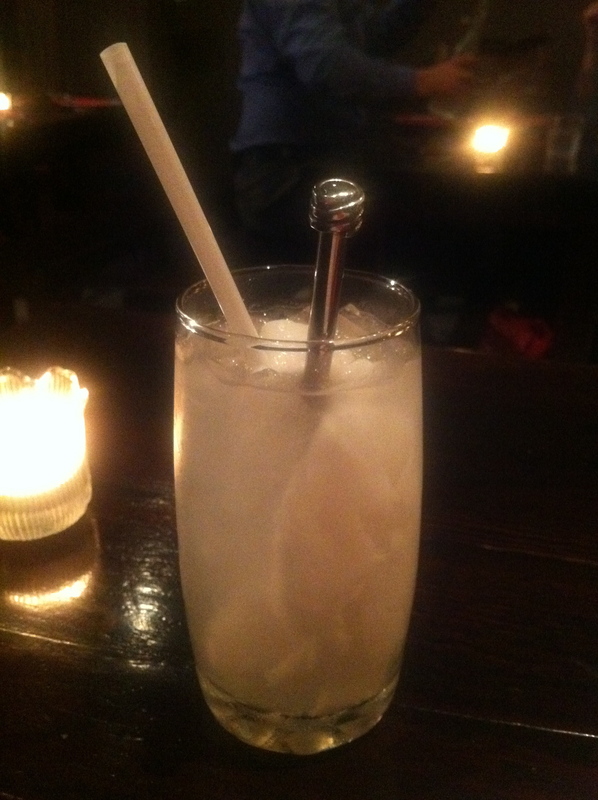 For starters, the Coconut Juice ($3.50) was the perfect welcoming drink to what was a really satisfying night for two people. Although the juice was not served in a real coconut, the way it was served was still simple, yet beautiful. The coconut flavour was mellow and authentic, definitely not sweet and processed, and came with real coconut chunks that you could eat later if you wanted to. Terrific food all round. So amazing. From the time we ordered our entrees, all five entrée dishes were out within 15 minutes, and none of these dishes could be faulted, they were all superb in their own way. 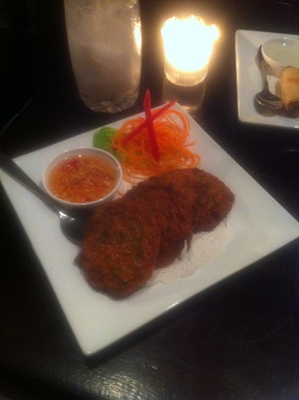 Firstly, the Fish Cakes ($6.90 for four) with Thai herbs and sweet chilli sauce were utterly delicious. The batter was light, and the fresh herbs were a real stand-out feature. You do not need too much chilli sauce in order to appreciate the subtle taste of the fish, combined with the powerful, zesty herb flavours which did not overpower the palette. After giving the fish cakes a try, it was time to try the Spring Rolls ($6.90 for four) with vermicelli and vegetables, wrapped in a crispy pastry, and served with plum sauce. 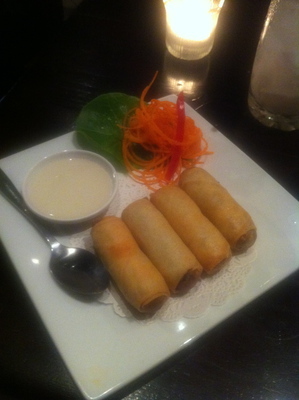 The most crispiest spring rolls in Sydney! The pastry is wafer thin, and the vegetables were well cooked. A surprisingly filling entrée. The plum sauce had a subtle vinegar taste at first, however as soon as my taste buds got used to this unique sauce, the plum flavour was sensational. Trying the Chicken Satay Sticks ($6.90 for four) was an absolute treat. The chicken was well cooked. 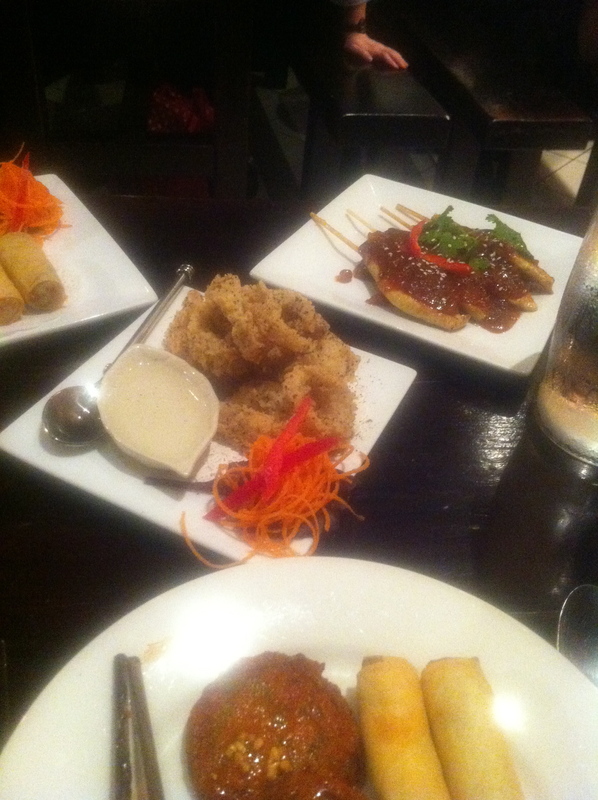 The texture of the chicken was rather smooth, and the peanut sauce wasn't overly thick. And whilst they appeared to look like little onions at first, the chunky peanuts were also enjoyed and blended in beautifully with the sauce and the chicken. 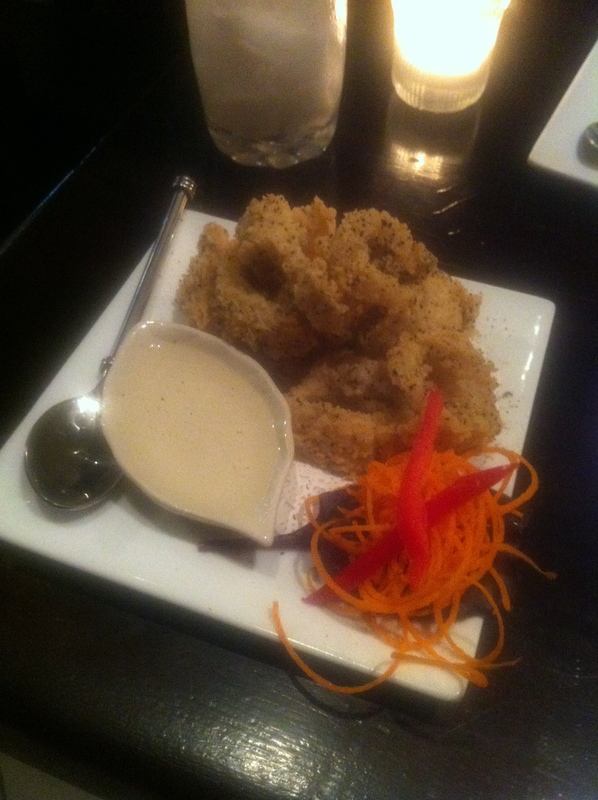 Finally, for the entrees the Salt and Pepper Calamari ($8.90) was better than expected, and was a knock-out entree. The batter was rather thick, and despite an abundance of pepper visible, the peppery flavour was just right. The thickness of the batter made it rather crunchy, yet it was light, fluffy and not greasy. Beautiful fresh fish was wrapped inside, and the plum sauce went surprisingly well with this dish. Highly recommended. Sydney, you're in for a treat. Naturally, you will want to soak in the pleasant ambience some more before the mains arrive at your table, and this is exactly what happened. The coconut juice was a real godsend. Although not the most favourite dishes of the evening, both of the mains were ordered from the specials of the month board, again Nat's creation. Spice alert: delicious and healthy Spicy Duck with Thai Herbs. The Spicy Duck with Thai Herbs ($19.90) was a cleverly executed dish. If your spice thermostat is not at an all time high, perhaps this dish might not be for you. Be prepared for an abundance of chilli and peppercorns. If you have your water nearby, you will be fine. The duck was a bit too chewy for my liking, yet was still fresh and delicious. 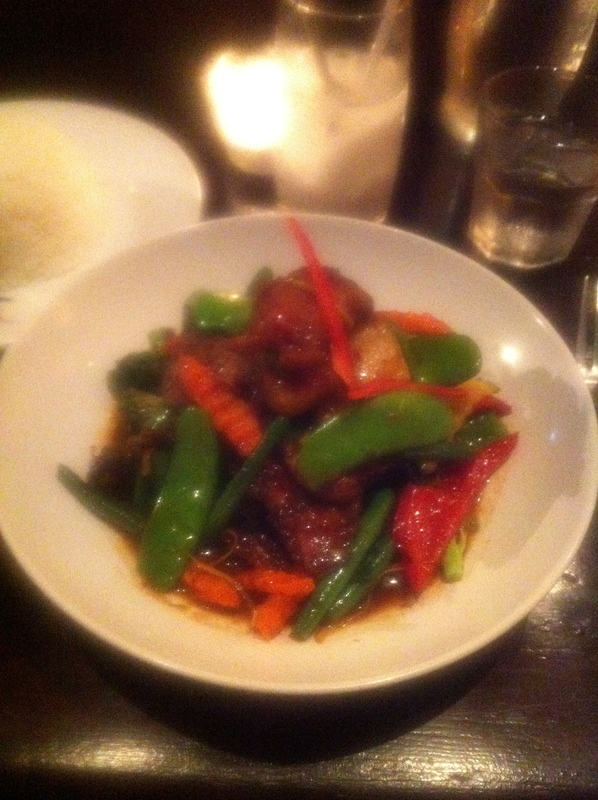 I loved the vegetables soaked in the soy like sauce. The sauce ensured the dish was rather moist and allowed the flavours of the duck and the vegetables to reign. 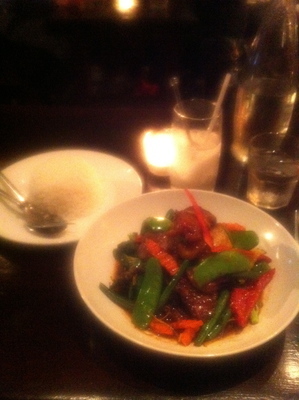 Why bother making your own stir fry dishes at home, when you can enjoy this dish at Blue Wok Thai. Seriously, this dish was better than expected. Attention to detail was paid yet again. The snow peas were as crunchy as they should be, and the carrots and beans in particular were stunning. 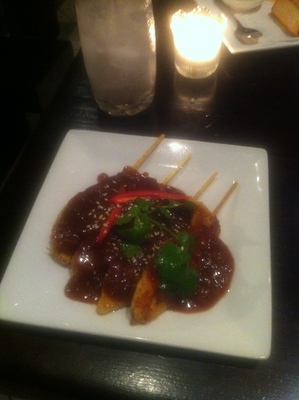 Some pieces of pineapple were thrown in to tone down the strong spicy flavours, and that was rather smart. Also, it would be helpful if you were hungry enough to enjoy the dish. This dish came with a plate of rice. Personally, I am not a rice person, however to be fair I tasted a couple of spoonfuls, and the rice was not grainy. Rather tasty indeed. 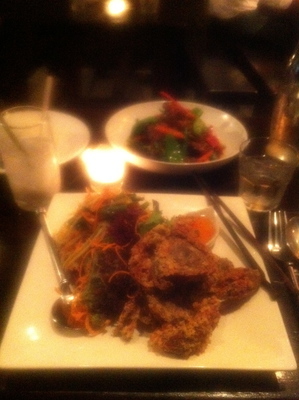 Finally, The Soft Shell Crab with Papaya Salad ($19.90) was different. The papaya salad worked in nicely on a bed of sweet chilli sauce. 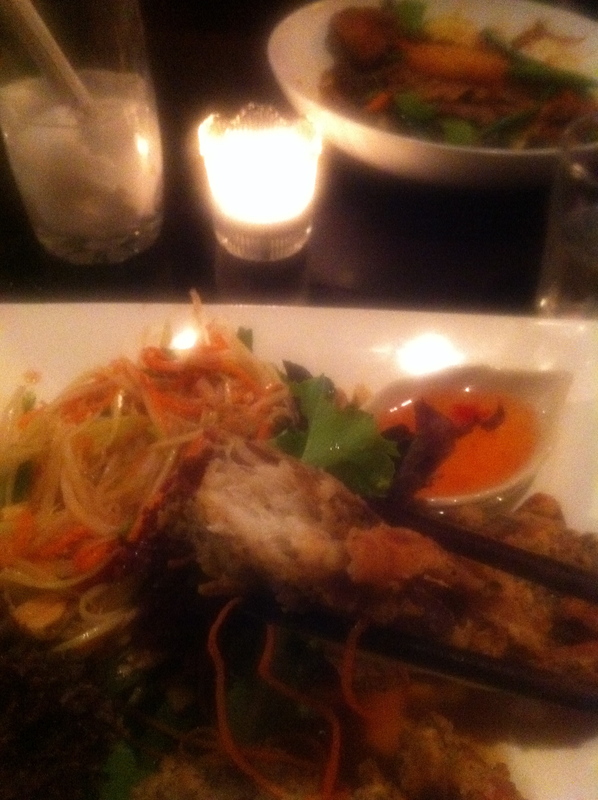 Upon tasting the crab without dipping into any of the chilli sauce, it could be considered a little salty at first. However, the batter blends in well with some fresh chilli sauce and a cool drink. Both of these mains will also blend in nicely with a glass of red wine. With the crab, you really need to be in the mood to eat it. A fairly unusual, yet well executed dish. The crab inside was rather tasty, however the batter on some of the pieces was way thicker than the crab. Not my most favourite dish of the evening, however I was (and still am) pleased with my Blue Wok Thai experience overall. The serving portions are rather generous. It would have been great to have completed this experience with one of their dessert dishes, yet I was overly full despite not having eaten anything earlier in the day. Never mind, next time. The experience overall receives full marks from me. Like me, you can try pot luck in getting a table, however if Tuesday night is anything to go by, it is highly recommended that you call the restaurant in advance and book ahead on busier nights such as Friday and Saturday. The staff are beautiful people, and BYO alcohol is also available. You will walk in satisfied and leave here even more satisfied with the food, service, value and ambience provided. Blue Wok Thai is one of Sydney's best kept Thai food secrets, yet now the Pandora's box has been opened, perhaps it is not so secret anymore, and this is a great thing. 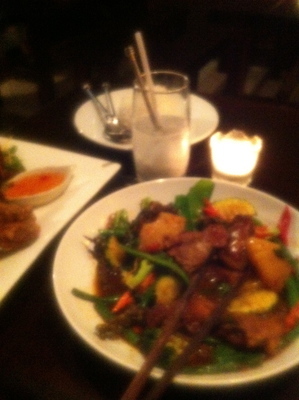 Highly recommended for all Thai food lovers, and those who love quality food full stop. The rice was even delicious as well. Awesome experience. 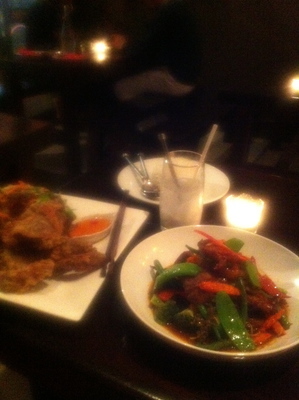 Thank you so much Blue Wok Thai. Why? Authentic Thai food cooked with love. Expect to be full afterwards. Cost: Expect to pay around $40 per person, it all depends on you. Quite cheap and affordable here.